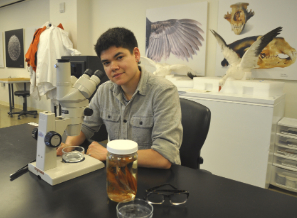 SAN FRANCISCO — Biologist Shayle Matsuda is San Francisco State University’s 2014 recipient of the California State University Trustees Award, the highest student distinction within the CSU system. Every year, the CSU Board of Trustees selects a single student from each campus for the honor. Matsuda, who is doing research for his master’s thesis and is seeking to graduate in the spring, has been named the Trustee Emeritus Murray L. Galinson Scholar for extraordinary public service to his home, university or to the global community. Yet Matsuda appears to be serving all three. Matsuda has spent more than a decade working with young people — particularly minority and at-risk youth who are under-represented in the science and research fields — and is the host of Science, Neat, a public event devoted to exhibits and discussions. His research focuses on nudibranchs, the marine mollusks often labeled sea slugs. He volunteered to work in the field where he could while making up the hard-science classes he had not taken as a UC Santa Cruz undergrad. “The more people I met in the field, the more connections opened up,” Matsuda added. Matsuda now runs a youth program at the Cal Academy and is a graduate assistant in its invertebrate zoology and geology departments. Among Matsuda’s fellow winners of CSU awards this year are individuals who have faced abandonment, homelessness, illness and other challenges on their way to becoming academic achievers as well as leaders on campus and off. The $140,000 in scholarships awarded by the CSU trustees this year is the highest ever in the history of the program. “Through the generous support of our donors, many of whom are first-time contributors to the Trustees’ Award program, we are able to help these scholars create a bright and successful future,” said CSU Chancellor Timothy P. White. For Matsuda, the support is more than merely financial. “The fact that CSU has my back as transgender is phenomenal,” he said. To see a brief video of Matsuda talking about nudibranchs and diseases research, click here.